The Vice President, Yemi Osinbajo, has said Nigerian youths have excelled in every sphere of the economy they have been involved. He stated this when he received a delegation of Not-Too-Young-To-Run Movement which visited him in Abuja on Thursday barely 24 hrs after President Muhammadu Buhari said that most Nigerian youths want everything free without doing anything. Osinbajo, however, challenged youths in the country to strive to acquire experience before seeking to occupy political offices in the years ahead. “It is true that young people are participating in every sphere of the economy and they are doing well, but they ended up there through one process of training or the other,” he said. The Vice President, who pointed out that leadership positions were not automatic, recalled that he served as a special adviser at the age of 30 and had been involved in pressure group activities before he became an Attorney-General and then, Vice President. He added that Nigeria did not need people who will just muzzle their way into positions. The Vice President said that issues of governance needed to be planned deliberately as making women to participate in politics and issues of girl-child needed to be taken seriously and addressed. According to him, this is because half of the women that should be participating in politics did not have the know-how. He added that there was also supposed to be plans for education to make the young people stand and grow politically. He said: “Just like you have to train before you can become a pilot, so it is for politics. “I think that whatever age a person chooses to run should not matter; what should matter is the preparedness of the person because elective positions require some skills. 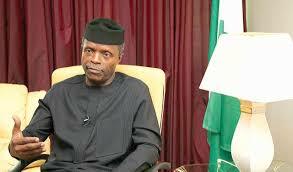 Osinbajo said that there was need for youths to move up the ladder of leadership to prepare themselves for politics. Osinbajo decried the fact that democracy and elective offices in Nigeria were based on people that had the resources “so corrupt people kept coming into office because they have the resources’’. “These are the kind of people we have in elective offices; so, we need to raise the bar so as to get performance and competence.’’ he said. He urged youths to challenge themselves with the big issues bedevilling the nation, and said that one critical issue to address was corruption. The vice president said that people stole the nation’s money with impunity and short-changed citizens. He said that in a developing economy like Nigeria, there was need to set the bar about competence and that the onus lay with the Not-Too-Young-To-Run Movement. He urged the youths to join political parties, be involved in politics and pressure groups so that the nation could achieve development through youth’s collaboration. Osinbajo said “that way, youths will be able to carry the cause and address the bigger issues that affect the country’’. Earlier, leader of the delegation, Mr Samson Itodo, said that the campaign for the youths was a movement led by young people that would like to contribute to national development. Itodo, who is one of the conveners of the Not-Too-Young-To-Run Movement, said that one of the reasons for the movement was inclusion of youths in governance, because democracy lost its vitality without inclusion. He said that there was also need for inter-generational dialogue between the youths and the elders to create a platform where young people could interface with elders. Itodo called for enhancement of quality of the electoral process so as to increase competition among all strata. “Today we have been able to inspire some young people to run for elective positions; over the world, there is a clamour for young rulers. “What we do is not to clamour for elders to leave but that we have faith in our democracy and it has to be inclusive because youths have the capacity, competence and integrity to hold offices,’’ he said. He called for an open political system that would accommodate young people, adding that it was a good thing that the National Assembly passed the Not-Too-Young-To-Run Bill. Itodo appealed to the vice president to support the bill and expressed optimism that President Mohammadu Buhari would ascent to the bill when transmitted to him. He urged youths to join political parties and be ready for the political process leading to 2019, stressing that “political power is not given, but taken’’.